Place the potatoes into a pan of boiling water and cook for about 5 minutes, drain and cool. Now insert a skewer through the middle of the potato. Using a small knife make little cuts through the potato until you hit the skewer. Place the potatoes into a small roasting dish, scatter over the rosemary, break the garlic up and scatter over the potatoes, season with the sea salt and milled pepper and finally drizzle over the olive oil and cook until crisp and golden. About 30 minutes. Great served with all meats, salads or simply on their own. 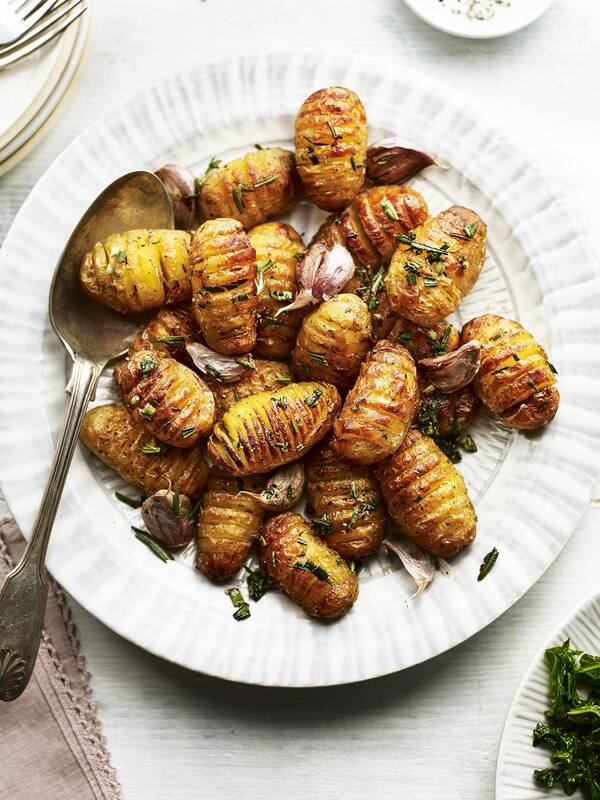 Check out this fantastic recipe in action below and head to our video recipes to discover more tasty Potato.IE creations! This recipe is great for getting through the sprouts at Christmas - the added blue cheese adds a different dimension. Try throughout the year with other leftover vegetables. Looking for a healthy and light curry? This recipe is perfect for those looking for a light option and is tasty too! Contains fish.